What's Included: Recharge: Seninburo Hot Spring Visit, Hongu. CEO-led city tours of Tokyo and Kanazawa. Ninja Temple visit. Minshuku stay with traditional meals. Instant Ramen Museum visit (Osaka). CEO-led city tour of Kyoto, including entrance to Nijo Castle and Kinkakuji Golden Pavillion. 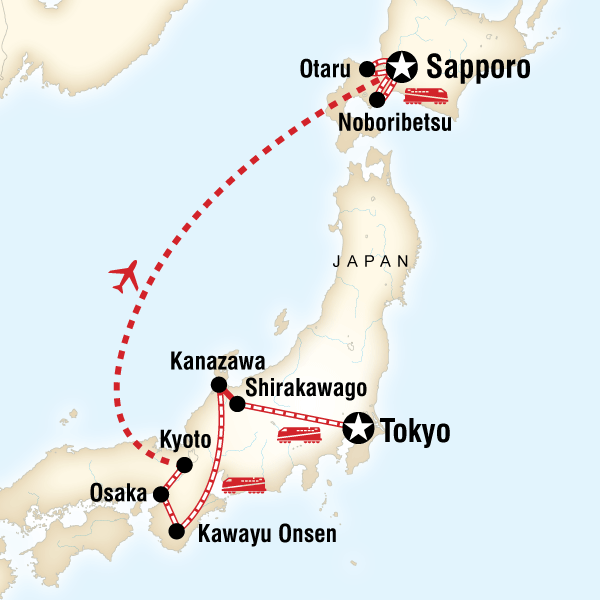 Orientation walks in Osaka and Sapporo. Sapporo Snow Festival visit. Snow Light Path Festival visit (Otaru). Jigokudani Park visit. Minshuku stay (Noboribetsu). Internal flight. All transport to/from included activities and between destinations. Meals: Eating is a big part of traveling. 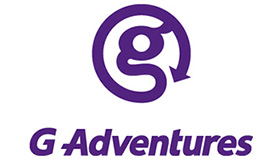 G Adventures knows that worldwide, local cuisines define the cultures. We think sampling regional delicacies are intrinsic to truly experiencing the country. We want you to be able to try foods according to your individual tastes, comforts, and budgets. Please refer to the Meals Included and Budget Information for information regarding included meals on your trip. Japan's kitchen is at your fingertips! Transport: Train, public bus, subway, plane, walking. Enjoy a morning tour of some of the city's highlights. With a free afternoon, opt to head out of town and view Mt Fuji or explore more of Tokyo's diverse districts. Enjoy a traditional breakfast before travelling to Kanazawa by bus. Wander through the samurai village on a short guided walk and take a guided tour of the Ninja Temple. Opt to visit the impressive 21st Century Museum, the geisha district, or Kenrokuen garden. It's a long, but scenic, travel day to reach the Wakayama prefecture. Kawayu Onsen is known for its large, outdoor onsen bath dug every winter into the river bed. Dress in the yukata (cotton kimono) provided by the minshuku (inn) and stroll over to the seninburo (large public hot spring) to enjoy an unforgettable soak in the steamy natural hot spring water. Osaka has heaps to offer including Osaka Castle Park, Shinsaibashi shopping street and Dotombori Bridge. Be sure to try "takoyaki" the city's famous squid snack. Osaka is a unique culinary destination ? opt for a group meal of "kushikatsu". Catch a flight from Kyoto to the island of Hokkaido. Enjoy some free time in Sapporo with an optional welcome meeting for any new travellers joining the group here. Take an orientation tour of the city before spending the day at the Sapporo Snow Festival. In the evening, depart for Otaru to experience this town's Snow Light Path Festival. Head back to Sapporo for the night. Travel to nearby Noboribetsu. Go for an easy hike through Jigokudani Park to view the scenery and geysers, or opt to visit the onsen town's spas. Enjoy a stay at a traditional inn for the night, complete with dinner dressed in a provided yukata (cotton kimono).